Archive for the ‘Operation Christmas Child’ Category. Maybe you’ve heard about Operation Christmas Child and even done boxes in the past. But has your family ever heard a personal story of how it impacted someone? Tears streamed down my face as I was walking the dogs down our street last fall listening to the Focus on the Family podcast, “Serving as a Family this Christmas.” A lady from Bosnia shared her testimony of how one of the Operation Christmas Child boxes blessed her both physically and spiritually years before when she was a poor child in a war torn country. Until then, my family had more or less been going through the motions of doing the boxes every year. We enjoyed the tradition and vaguely knew it helped people. We had even read some of the follow up stories from the mailings we would get from Samaritan’s Purse after the deliveries. However, there’s nothing quite like hearing something first person! This lady’s story had the beautiful result of tenderizing our hearts as we shopped, wrapped, and packed our boxes. I intend for our family to listen to this again before we get started on the shoeboxes this year. You can hear the story by going to this Focus on the Family link and clicking the “Listen Now” tab. The portion I’ve referred to is at counter 16:30-26:10. If you listen, please keep in mind that it’s a 2013 broadcast. The correct dates and information for 2014 giving can be found here. 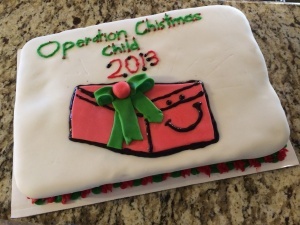 Use the Operation Christmas Child website to explain how it works, if your family is unfamiliar with it. There are clear instructions and fun, age-appropriate videos showing the packing process. If your child is old enough, listen to this audio mentioned above or look through these videos on the Operation Christmas Child website. Encourage your child to use some of his allowance to help purchase gifts. Take your child with you to shop for the items. On the way to shop, pray out loud that God will give you wisdom to pick out exactly what the recipients will love and need. Share with your child how cool it is that God already knows who is going to receive your family’s boxes! Let your child have input (within reason) as to what to purchase for the boxes. (This is challenging for a control freak like me, but God can work through it!) We try to balance fun things with necessities. Consider having a “packing party” with families from your church…Or, if anything, just with your family. This is one of our favorite events every year with our Life Group! All the families bring their own boxes, items to stuff, wrapping paper, tape, and scissors. The families spread out across the floor of the living areas and get to wrapping and packing. Yes, it can be a bit crazy…Christmas music is blaring, it’s noisy with all the kids, we continue to struggle with the “best” method of wrapping those cantankerous boxes, and we must all be on guard our for roving toddlers and preschoolers trying to pilfer items that look fun! But that’s all part of the charm! Again, pray over the boxes for the children represented by them. Brainstorm ways to pray for the kids that will receive them: health, food, water, safety, positive influences in their lives, their future, to come to know and/or grow in Jesus. Consider creating and putting a “Gifting Gift” under your tree to help you remember to continue to pray for the children who will receive these boxes. See http://www.parentingwithscripture.com/the-gifting-gift/. 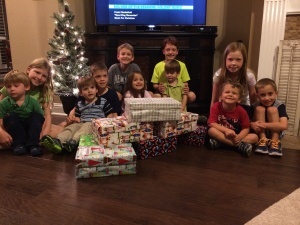 Discuss with your family why we take time, energy, and money to do things like Operation Christmas Child. You can easily find applicable Scripture under the topics of Giving, Ministry, Sharing, Charity, etc. in Parenting with Scripture: A Topical Guide for Teachable Moments. Pictures from our Life Group’s OCC Packing Party 2013! Any other great ideas related to Operation Christmas Child? Please Share!